FREE Popcorn at Emagine Theatre Coupon! 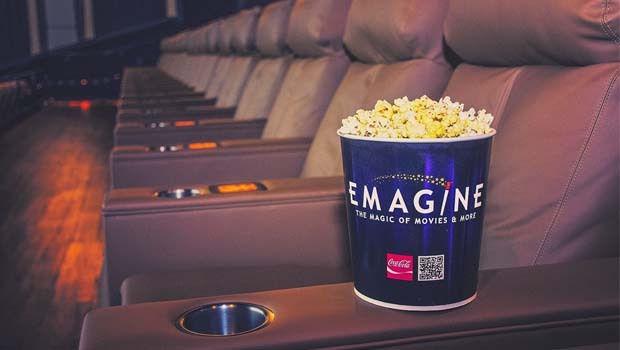 Enjoy a FREE 44oz popcorn with your next ticket purchase at any Oakland County, Michigan Emagine Theatre location including The Riviera powered by Emagine courtesy of Oakland County Moms and our friends at Emagine Entertainment. See below for exact locations & dates where this coupon is valid. To use this coupon for FREE popcorn at Emagine Theatres, simply show this coupon page on your phone to the ticket agent OR you can PRINT THIS PAGE to give to the ticket agent. You can also remind the ticket agent the ticket promo code is OCM1. Code is ONLY VALID Mon-Thursday, guest must show on phone or have a print out. Code is NOT VALID May 15 – Aug 31 & Nov 20 – Jan 1, 2020. FINE PRINT – Free 44oz Popcorn with ticket purchase. Limit one per guest per day. No cash value. This offer expires 5/14/19. Oakland County Moms also has a contest where you can win FREE Emagine Movie Theatre tickets. Don’t forget, Emagine Theatres hosts awesome events and birthday parties for kids! The Oakland County / Coupons section of Oakland County Moms is designed to offer Oakland County Moms readers discounts on goods and services provided by advertisers and supporters of OaklandCountyMoms.com. If you’re an Oakland County business that would like to be listed in this category, contact us to discuss our affordable business directory listing rates. FREE Popcorn at Emagine Theatre Coupon for Oakland County Moms readers.